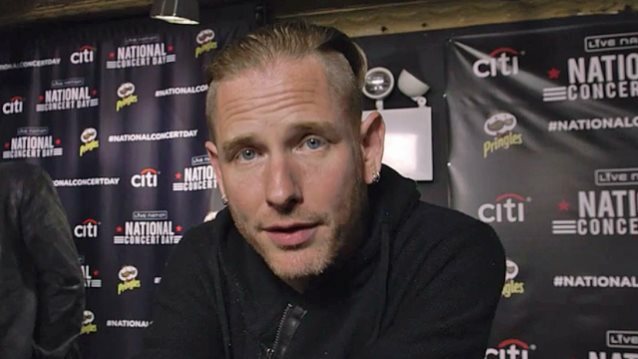 During an appearance earlier this month at the Live Nation National Concert Day event in New York City, SLIPKNOT singer Corey Taylor spoke to Rolling Stone about a possible musical direction for the masked metal group's forthcoming sixth album. "We're trying to think of where we can go musically that still has the soul of what we're trying to say, what we're trying to do, how we're trying to help people evolve with their lives," he said (see video below). "So it's one of those things that we're kind of looking to our influences now. 'Cause we loved everything from old-school thrash to bands like NEUROSIS, NINE INCH NAILS, you know, and [we're] just trying to kind of take stock of wearing our influences a little more on our sleeve and seeing where that will take us." Taylor told radio host Full Metal Jackie in a separate interview that the band's music will have to evolve. Asked about the group's musical progression, Taylor said he and other key members have been discussing their future, explaining: "I mean, this band has always tried to find the path less traveled. We've always tried to expand the range of the music that we're making and find new ways to speak our piece, find new ways to kind of push our agenda and our message. And it's getting to the point where, at some point, the music will have to evolve." He continued, "We've done really great things to broaden our musical horizons. At the same time, though, at some point it's gonna have to twist and it's gonna have to change even more... Will it still feel like SLIPKNOT? Absolutely. We write a certain type of music, even though that music may be very, very eclectic and varied, we still write what I consider SLIPKNOT music. But at some point, that will have to evolve and become something new, because our message will have to change." SLIPKNOT has hinted that its next studio effort could be a double concept album. The group's last set, ".5: The Gray Chapter", came out in late 2014. Taylor has said in other interviews that SLIPKNOT will take a "couple of years off" after completing the tour cycle for ".5: The Gray Chapter". Taylor explained, "We're gonna finish touring and then we're gonna take a couple of years off again to let everything chill. I'm gonna go do my thing, [and] everybody else's gonna go do their thing... then, in a couple of years, we'll get back together and see what happens again." SLIPKNOT will head out on a massive North American tour with MARILYN MANSON and OF MICE & MEN this summer, starting on June 9 in Salt Lake City.